Lineshape analysis was conducted on the experimental photoreflectance spectra of modulatiod-doped heterostructures using empirical lineshape models. From the fitting, the GaAs band gap energy was calculated to be 1.42 eV. Fitting parameter ħΩ was also used to calculate the electric field FħΩ which was then compared to the value obtained from FKO linear regression analysis. The comparison showed % error ranging from 5% to 10%. The relationship between the electric field and spacer layer thickness was then observed to be inversely proportional as shown by the fitting and from analytic calculation. M. Bacaoco, A. Somintac, A. Salvador, and E. Estacio. 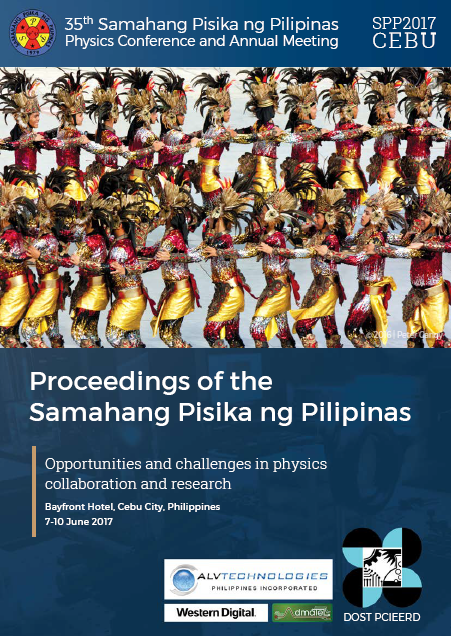 Photoreflectance lineshape analysis of modulation-doped GaAs/AlGaAs heterostructures, Proceedings of the Samahang Pisika ng Pilipinas 35, SPP-2017-PA-29 (2017). URL: https://paperview.spp-online.org/proceedings/article/view/248.